Hey Buddy! 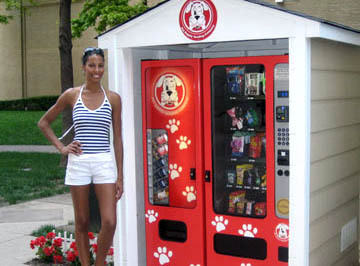 is another example of a unique and innovative vending machine, and this time dispensed products are everything you could need for your dogs. I recently posted 2008's Most Weird and Wacky Vending Machines and this one didn't make the list because it's more impressive than it is strange. Similar to the Trek Stop, which offers consumers just about anything they could require during a cycling related equipment crisis or fun bike ride; the Hey Buddy! vending machine lacks nothing that you could possibly need when hitting the town with your dog. The founder came up with the idea over two decades ago when realizing there's no available solution to a dog owner's worst nightmare; running out of pickup bags when nature has paid a call to your furry friend. 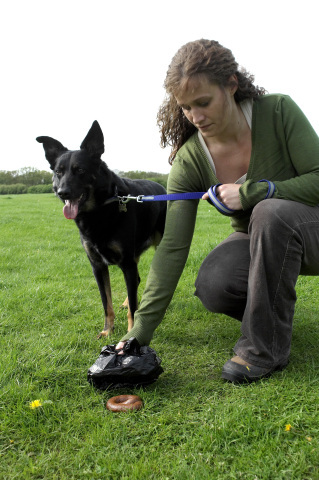 Not only is it embarrassing when you can't pick up after your pet, it's also illegal in most communities. So unless a fellow dog walker comes by with a spare bag to save the day, you're usually out of luck. Now with the Hey Buddy! which can be placed in parks (human or dog), apartment complexes or just about anywhere; dog lovers have a simple solution at hand when they are able to purchase more bags. 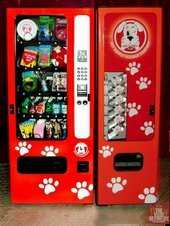 It would have been a pretty boring (though slightly humorous) vending machine if it had only offered pooper-scooper bags, so with foresight, Carlotta Lennox decided to include a whole line of doggie goodies in her dispensers. Since its unveiling, the Hey Buddy! has carried pet food, toys, flea collars, leashes, vitamin water and treats so no owner has to have their pet go without. Hey Buddy! is now beginning to offer franchise opportunities for interested investors in the United States and Canada; for approximately $750 in start up costs, anyone can be the proud owner of this innovative vending machine. Next, I'd like to see a vending machine for humans that offers a diverse range of needed products to meet the standards set by this dog-centric vending solution. Thank you for your comment. It does market itself as a franchise...but I can see your point, I can't see how the same level of support would be required with a vending machine as you'd encounter with let's say, a retail store. I guess it's a matter of perspective. Thank you for responding. I don't even have the desire to look this vending machine opp up, to see if they have registered as a franchise, in the legal sense. That is because for me, anything that has a total investment of $750 is probably not offering much in the way of anything. Maybe someone can prove me wrong, but stuff like this has a very short afterlife, in my experience.